This uniquely refreshing caffeine-free infusion offers a delightfully mild yet earthy flavour. Heath & Heather are herbal pioneers. They have built their reputation on blending fruit and herbal infusions that are 100% natural. Only natural ingredients, containing no artificial flavours, preservatives or colouring are selected for use. 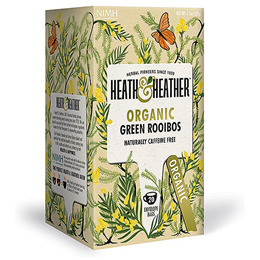 Today Heath & Heather still has strong heritage as herbal specialists and are committed to developing a range of fruit and herbal infusions using only the finest natural ingredients, helping to support a natural, healthy lifestyle. Add a Heath and Heather fusion bag to 200ml of freshly boiled water & steep for 3-5 minutes. 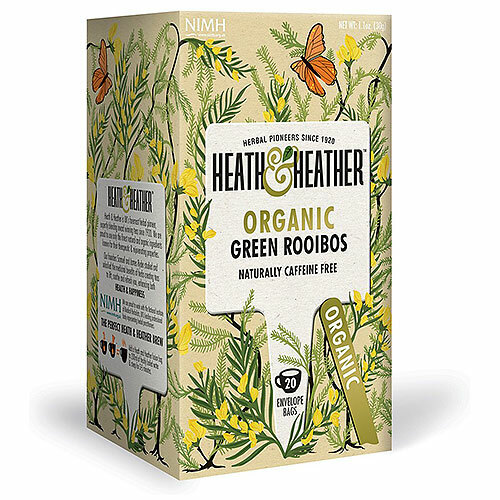 Below are reviews of Heath & Heather Organic Green Rooibos - 20 Bags by bodykind customers. If you have tried this product we'd love to hear what you think so please leave a review. Very pleasant tea with soft flavour. Individually wrapped sachets keep tea in good condition. I love it.